We are in the age of Big Data, and there are a bunch of technologies and startups popping up all over the world that deals with Big Data. One of the hottest and fastest growing technologies is Apache Spark. Apache Spark is a completely open sourced, scalable data analytics and cluster computing framework. Apart from general analytics, it also features exciting Machine Learning capabilities with Spark MLLib, SQL-Like queries with SparkSQL, support for large graphs with GraphX, and streaming capabilities with Spark Streaming. (This is my favorite reason) It supports not 1, not 2 but 3 languages: Scala, Java and Python! You can now write terse python or scala code in seconds. For instance, the ubiquitous word-count example is a just single line in Python / Scala. Spark’s data structures – called Resilient Distributed Dataset (RDDs) has inbuilt fault tolerance. Spark’s API is more basic (or primitive) than Hadoop’s MapReduce – allowing you to build more general applications from the ground up and freeing you from the MR constraint that Hadoop enforces; at the same time map reduce APIs are retained. MLlib is Spark’s scalable machine learning library consisting of various commonly used algorithms. It is an alternative to other scalable Machine Learning libraries for Big Data, such as Apache Mahout. It has plenty of algorithms to choose from, ranging from simple summary statistics, to complex learning algorithms like Decision Trees. Recommendation – Recommend relevant products based on history. Eg: Predicting “Recommended Items” in a E-Commerce site based on user click-stream. Spark supports popular algorithms like Naive Bayes, Decision Trees, Support Vector Machines, Alternating Least Squares, among others. Apart from that, it also provides bare-bones optimization algorithms if you’re in the mood to write your own Machine Learning algorithms! Data comes in all sizes and If your data happens to be very large, then you’re out of luck if you happen to use SQL. If you transition to using Hadoop to store your data, then you lose the ability to query your data like you used to. Hive, Impala, are all answers to that conundrum. But all of those run on Hadoop! With Spark-SQL you can run queries on Spark and take advantage of it’s speed and ease of use. If you’re already using Hive, you can make a switch easily to Spark-SQL, since it also supports HiveQL. Spark-SQL is fully fault-tolerant, and also allows you to cache tables in memory – a useful feature for frequently-accessed tables. Spark Streaming makes it easy to build scalable fault-tolerant streaming applications. It is easy to use and has all of Spark’s inbuilt fault tolerance. It features lightweight but fast APIs, and offers ‘exactly-once’ semantics out of the box – something that other technologies like Apache (Twitter) Storm does not offer. A great feature of Spark Streaming is that you can use the same code for streaming and batch operations. Spark’s GraphX library allows you to seamlessly work with both graphs and collections. 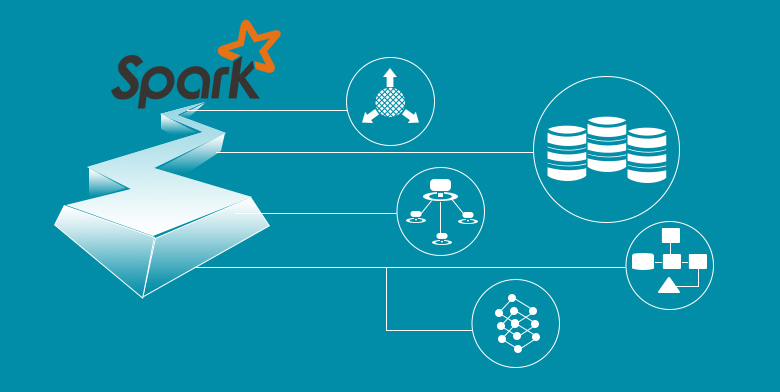 With comparable runtimes to other Graph Libraries like GraphLab and Giraph, GraphX also retains Spark’s immense flexibility, fault-tolerance and speed. It has common algorithms for most common requirements of internet-scale graphs, including PageRank. It also has a very flexible API, which allows you to use it effectively. Then Spark is your answer.